Flowmaster Delta Force cold air intakes are the elite kits you can call upon to help attain maximum performance and efficiency for your vehicle. All systems feature ultra-trick looking durable cross-linked polyethylene intake tubes with a large high-flow conical shaped air filter ensuring it will trap more dirt/dust particles than the typical filter. They are highlighted with Flowmaster logos to show others you're serious about quality and performance. Installation is easy utilizing factory mounting points. 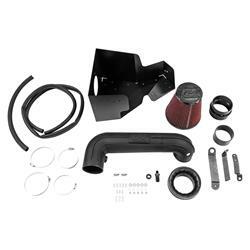 Take "operation cool airflow" to the next level with the addition of Delta Force cold air intake kits.